The murder of the Marrs caused national outrage. A mass killing of this sort, taking place in the victims own home was unusual and terrified everyone. A hundred guinea reward was posed for information leading to the identification of the killer or killers. The only tangible clue the police had to go on was a maul, a heavy shipwrights hammer that had been found at the scene of the crime clotted with blood and human hair and obviously one of the murder weapons. Then on the 19th December the murderer struck again, at the King’s Arms Tavern in New Gravel Lane (now Glamis Road). A night watchman had been passing the public house in the small hours when he found a half naked man trying to climb down a rope of knotted sheets from the top storey of the building watched by a crowd of curious on-lookers . 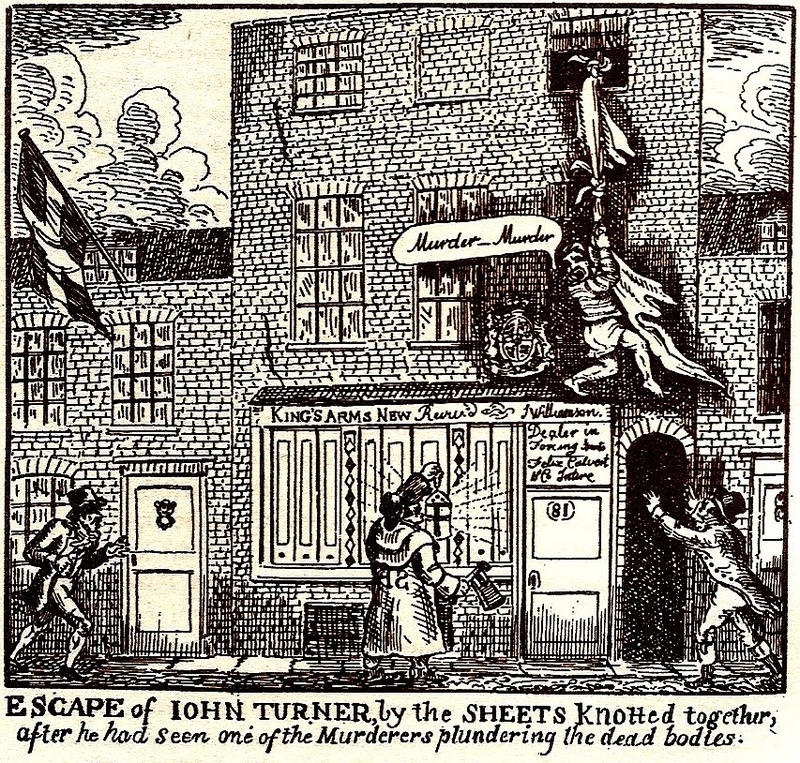 The man, a lodger in the pub by the name of John Turner, started yelling that there was murder being committed inside. The crowd quickly broke open the door of the cellar and inside the bodies of the landlord, John Williamson, 56, his wife Elizabeth,60 and a barmaid Bridget Harrington were all discovered with their heads battered in and their throats cut, in the same manner as the Marrs. The Williamson’s 14 year old granddaughter survived – she slept through the attack and the murderer or murderers probably did not realise she was in the house. The horrified crowd armed themselves and thoroughly searched the premises looking for the murderer. The corpses of the victims were gingerly taken to their beds to await the undertaker and a hue and cry was raised to find the perpetrators. Fire bells were, London Bridge sealed off to stop anyway fleeing south of the river and the Bow Street runners summoned to start the man hunt.